Coaching volleyball can be a VERY rewarding job. You get to go home from practice every night, happy with how your players are developing. During games, you celebrate with players when a skill finally “CLICKS” for them. After long tournament days, you go home exhausted but happy that you got to spend it with the group of goofballs you call your team. This is what we all picture when we start coaching. And it can be reality! Successful coaching starts OFF the court. That’s right! 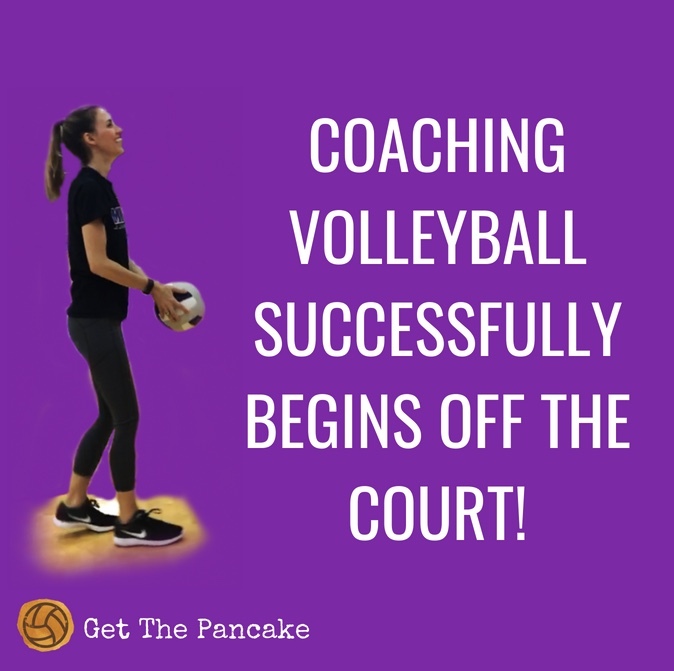 You may be worried about technical skills (I was a horrible setter, how am I going to teach setting!?) and about which drills to run in practice, but, to be honest, that’s the easy part. There are TONS of articles and videos online, available for FREE, which will walk you through the latest techniques and give you new drills to run at practice. If you want to have a good season, you need to think logistics. How are you going to select who’s on your team? What are you going to run for tryouts? Who is going to be your assistant? Your pre-season preparation determines your end of season results. Take some time to sit down and think about your season in its entirety. Like, literally look at a calendar and go week by week. You need to have a general outline for your entire season before it even begins! During your “meet the team” party (oh wait, you should have one of those? That probably takes some planning ahead of time, huh?) you’ll want to have a few talking points about what you expect for the season. Newsflash: Unless you PLAN, you won’t have any talking points past “I think this will be a good season” and you might even lose some credibility when parents learn it’s your first time coaching volleyball. New coaches don’t know about the little things that make a BIG difference. I’ll give you one now. Being clear and concise about team rules from day one is going to turn your team into a well-oiled machine. Rules are important. But consequences might be even more important! Image telling your players that they are not allowed to be late to practice, having someone show up late, and then not having clear guidelines to follow. You make up consequences as you go through the season, trying to be fair and apply punishment equally. But somewhere down the line, you slip up and give a less harsh (or more strict!) punishment than before, and all of the sudden you’re playing favorites. Now you’ve lost control of your team. A lack of experience is one of the biggest barriers for new coaches. Had you coached before, you’d know to determine consequences ahead of time, and to apply them consistently. Obviously you’ll give yourself wiggle room for certain circumstances, and you won’t know EVERYTHING ahead of time, but you want to give yourself a fighting chance! And this is just one small part of coaching volleyball. You have to lead your players through a process. There’s a certain rhythm to volleyball seasons. Once the team is formed, everyone’s excited and having fun playing together. Practices generally leave you feeling good, with a few hiccups here and there. How do you make a lineup again? Should I sub out Emily? That's her third missed hit in a row. Didn't I promise playing time? Should I still sub anyway? OK, so now your first game is out of the way, you know what needs improvement and what’s going well. You start to cater practices to specific skills and probably start working on your lineup. This is where the drama begins. And it’s gonna get uuuugly. At least, it CAN. But if you’re READY for the conflict, you’ll be able to address it and move on. Setting expectations early on allows for a streamlined season. Trying to direct your team by REACTING to the season just won’t work. Volleyball can get emotional, especially if we’re trying to make things up as we go. With my first team I was creating rules halfway through the season. I also did some weird “tryout” thing where I tried to redo all of the positions on my team because I was second guessing my initial decisions. I got a lot of confused and angry phone calls from parents, because their daughters got in the car after practice and told them I was doing tryouts again and they thought I was going to make cuts. You’re welcome. I made the stupid mistakes for you, so you don’t have to! If you know how to setup your season from the beginning, it will run smoothly and you will feel confident anticipating what comes next. But if you decide to wing it, you’re going to feel exhausted by the end. Imagine trying to do your job without a job description. Think about coaching this way: Your job is to give the player’s THEIR job description. They need to know expectations in order to perform their job well. I already told you that I made some stupid mistakes in my first season. And I tell ya, my second season was a LOT better. I took what I learned from my mistakes, and applied that knowledge in a way which took my team to the next level. And so after my second season was a success, my third season got even better. And the 4th team? Better still. I started coaching in 2008 and have grown so much over the last decade! There are so many coaching books available today, but I still see coaches making silly mistakes (the same ones I made) and I felt called to help others out. That is why I wrote my book. Other coaching books give you DRILLS. That’s NOT what you need! Especially with so many free options available online! 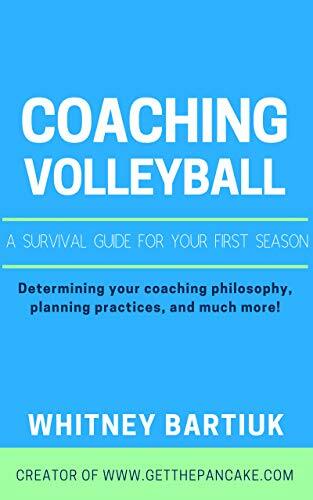 You need a guide which takes you all the way from making the decision to coach, right up until you are planning to start your second season. Ready to stop QUESTIONING yourself and feel CONFIDENT in your coaching abilities? By getting a glimpse of what’s to come, you’ll feel well-prepared to handle the curveballs that are sure to be thrown at you. It’ll give you tons of examples and even more ideas for ways to make your season better! By preparing yourself mentally for what’s to come, you’re giving your team a better chance at success. You can either walk into the gym and HOPE it goes well, or you can walk into the gym KNOWING it is going to go well!